The Tide Hunters, those who live beneath the waves and call the deep abyss home, have come to the shores to seek a treasure. But their treasure seeking would not be opposed, a powerful Lich has dragged the undead from their graves and crypts to plunder this same treasure. Three possible locations of the treasure. The Tide Hunters are led by the Cecaelia, with her commanding presence she directs her forces with cunning. 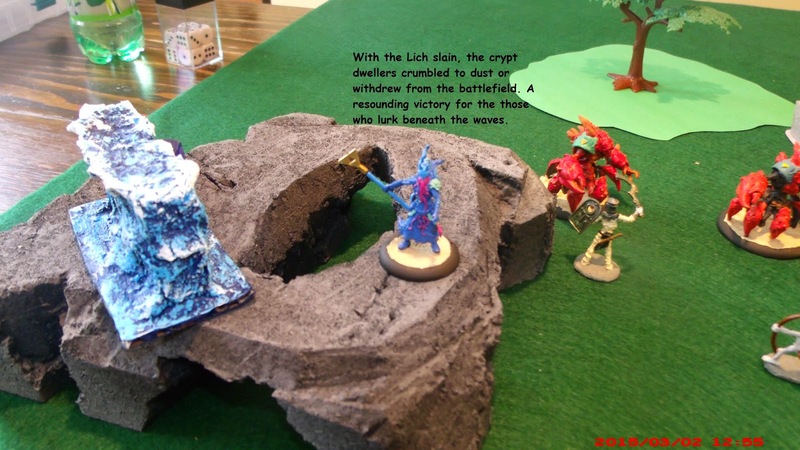 She has brought two mighty Leviathans in thick shelled armor, two Knights of the Depths, a group of Abyss Defenders, and a deadly Warlock of the Waves. Fresh from their graves come the Crypt Dwellers. Lich Lord Alzemmon brings a horde of Tomb Guard mummies, skeleton warriors and archers, a tough Death Knight, and a vile Worm Warlock. In the center, the Death Knight and skeletons march to the central hill while across the way is the Cecaelia with her Abyss Defenders. 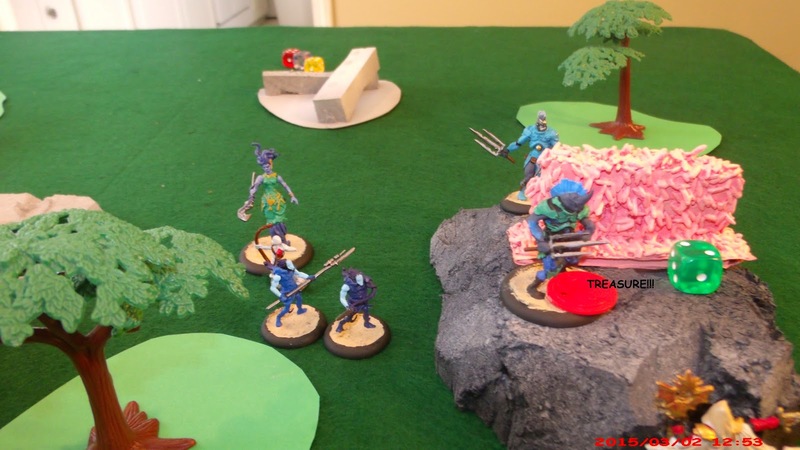 The Knights of the Depths go for the left most treasure location as the Worm Warlock and guard move to contest the hill. Surprisingly, the skeletal archer's arrow sails off into the distance as the Lich's fireball explodes harmlessly among the rocky hill. The Worm Warlock summons a Wall of Worms! The disgusting seething mound of insects forces the Knight of the Depths away from the potential treasure location. The Wall of Worms would have a respectable C of 2 to hold back the Tide Hunters. The Warlock of the Waves sought to show his own power. Summon a Wall of Water! This would help against the skeletal archer and prevent any from crossing up onto the plateau of the hill. Also a C of 2. The Death Knight forges his way up the central hill as the Abyss Defenders climb up as well. The Wall of Worms would prove to be a resilient defense against the Knight of the Depths. 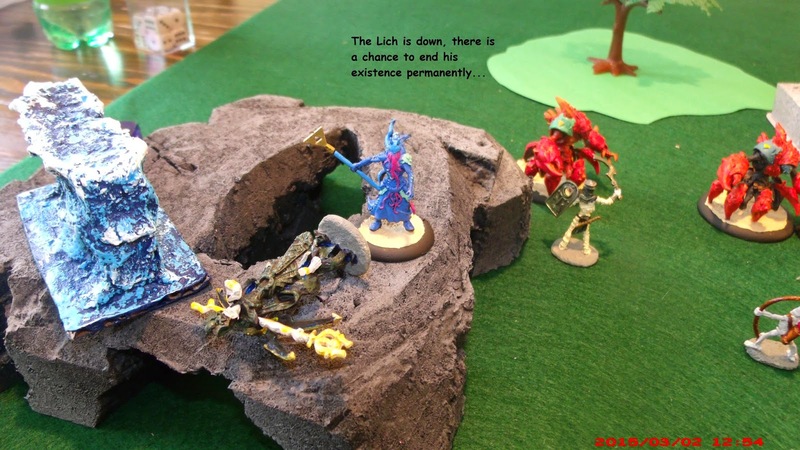 The deadly Lich flies easily up onto the plateau of the right hill, close to the treasure there. 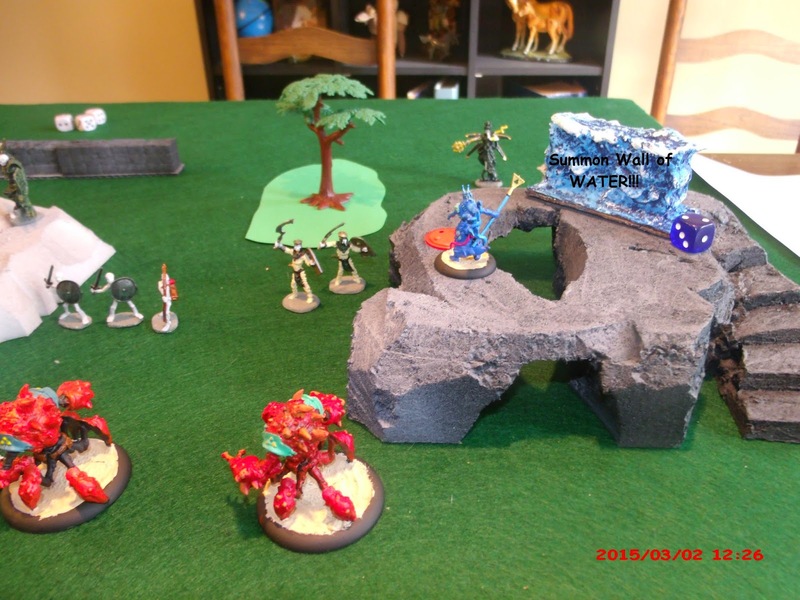 The Leviathans wade into the skeletons and Tomb Guard, using their bulky armored bodies to hold the gap. 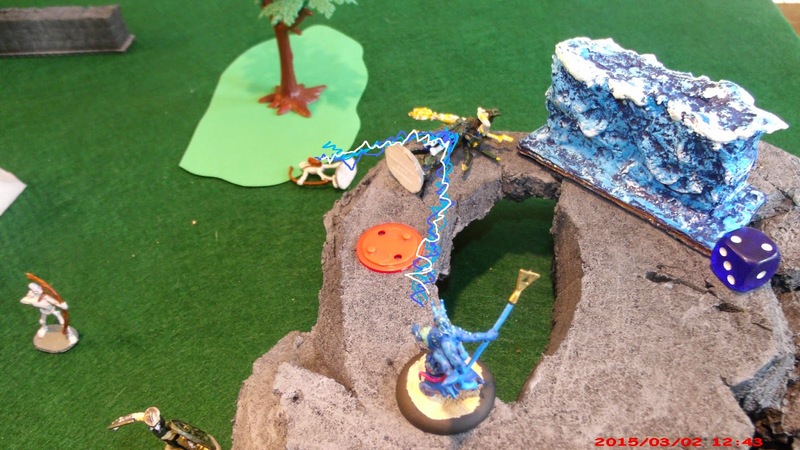 The Warlock of the Waves uses a potent Lightning Bolt to lay low the Lich and a skeletal archer. 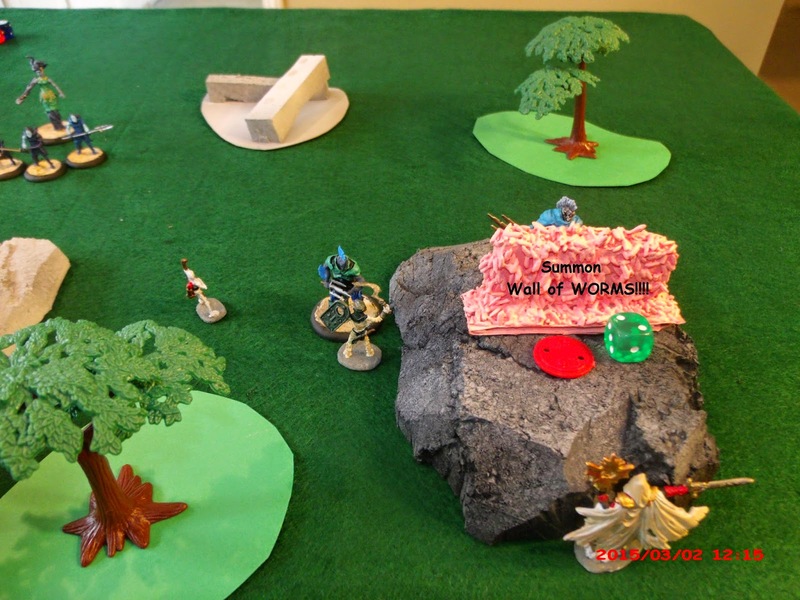 The Cecaelia boosts the quality of her troops to push the left hill as they discovered the center hill does not have the treasure. The same Knight of the Depths continues his assault on the Wall of Worms ineffectually. 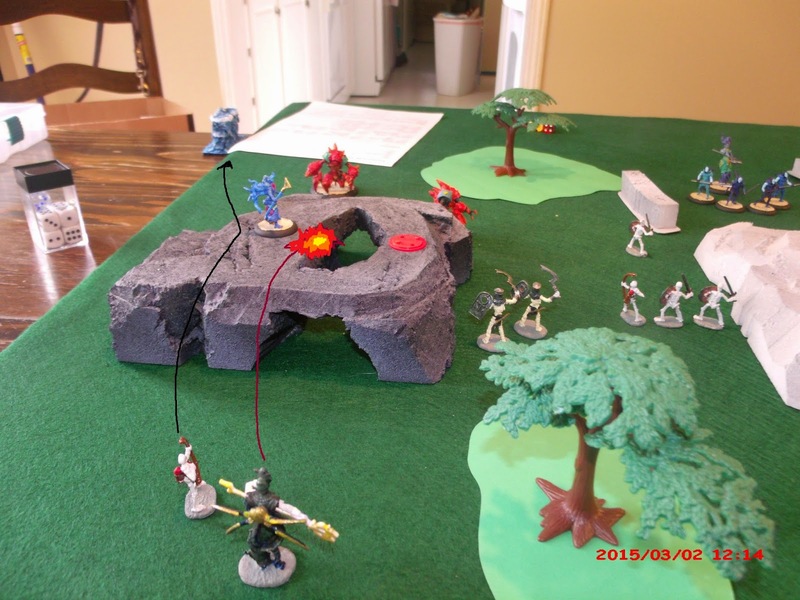 In an all out attack, the Cecaelia's bolstered troops clear the way for the other Knight of the Depths to climb the hill and find...the TREASURE! 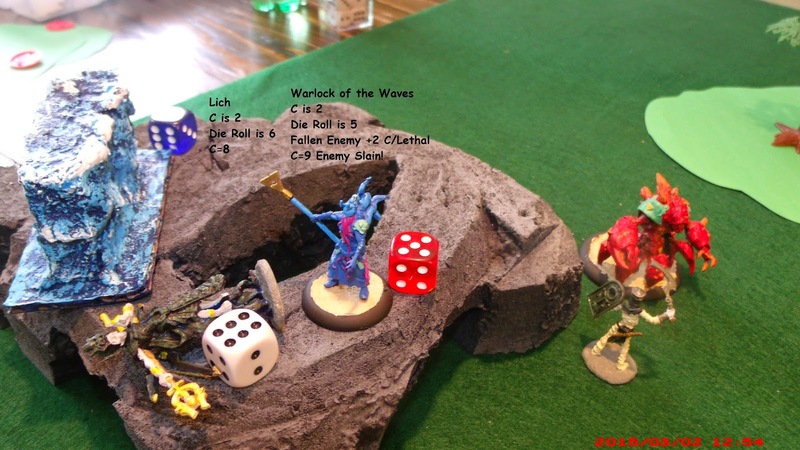 Barely winning combat, the Warlock of the Waves smashes the fallen foe. 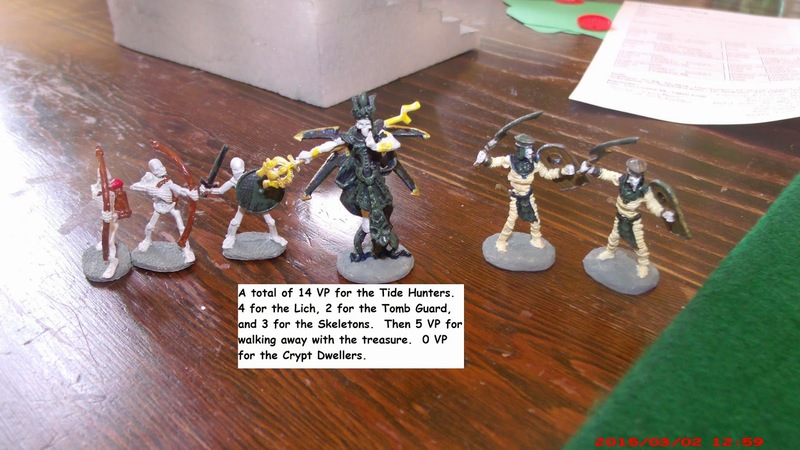 In the ensuing DECISIVE VICTORY, the Tide Hunters would win 14 VP to the Crypt Dwellers 0 VP. It was only fitting that the Warlock of the Waves would be the winner of the Upgrade this time around. He receives the trait *Sub-Commander*.